Tony, I just wanted to touch base with you following my training with Mark. Just wanted to let you know that Mark is a top-notch instructor. He is a consummate professional, and I have never flown with anyone who challenged me as much to be the best pilot I could be. He is an asset to your staff, and I enjoyed working with him. Contributing Editor, Plane & Pilot Magazine Los Angeles, Ca. Standing here, staring at the temporary airman’s certificate that tells me I passed my Instrument Rating check ride, it’s hard to believe that 10 days ago I was a pure stick-and-rudder pilot with very little IFR knowledge. The AFIT training program was intense, but rewarding beyond measure. The complexities of IFR flying that seemed daunting on day 1 became clearer and easier to fly as the days went on, and the whole process made more sense each day. Spending all my training hours in the actual airplane instead of some simulator/airplane mix was unbeatable. To me, the key to AFIT’s program is the individual instructor. Mine was John T. and I can’t envision a more ideal match. Clearly, he has a love for aviation and for teaching, as well as a deep reservoir of experience to draw from. He tuned in on how to teach ME, and it’s only because of John’s passion and experience that I learned as quickly as I did. Thank you John, and kudos to AFIT’s accelerated program for transforming me into a safer, more precise, instrument-rated pilot. I want to thank John for working with me on my accelerated instrument training. When I signed on for the AFIT 10 day intensive training course I was apprehensive regarding the ability to train in such a short time frame for the most difficult rating to obtain. But once John showed up and started working with me I started to believe it was possible. I am an older pilot, so my ability to learn is probably not as sharp as it once was, but the practical experience that John gave me was invaluable, and his mastery of the Cirrus Perspective avionics on my SR 22 helped me to actually learn how to put all that system power to use. As background I obtained my private in January of 2012 and soon after bought a SR22 with Perspective. Even though I was doing a lot of cross country flying I knew I needed to get my instrument rating in the near future. I learned a decent amount of the Perspective system during my VFR flying, but when John began my instruction I realized the system could do amazing things that just reading the manual wouldn’t do justice to. Just unlocking the potential of the advanced avionics on the Cirrus was worth the price of the training, but that was just touching the surface. John made sure I was more the competent hand flying the airplane when we were done. He also had me master the arrival procedures required for instrument flying, as well as getting me up to speed with the interaction with ATC while flying IFR. I don’t have and apprehension filing and flying IFR now (within reason), and that is because of the excellent training I received during my accelerated course. Because of an unexpected illness on my part, the Holiday’s, rough weather and scheduling issues with the DPE, 30 days elapsed between John leaving Florida and me taking my checkride. My training was so thorough that I passed my ride with flying colors, and I even received an email from the DPE telling me what an impressive job I did on my check ride. Without the training provided by AFIT things would not have gone as smoothly, and I credit John with getting me fully prepared not only for my check ride but also for making me a safe and competent IFR pilot. And I can also tell you that the 10 day intensive training is the only way to go, as I know that going for an hour or two once a week would have been inefficient, and it could have taken a year or more to get my training completed. I am not going to lie, there were some tough days and this training is difficult and demanding, but you will be a much better pilot when you are done. I highly recommend AFIT and John. It seems like only a couple weeks ago that I was referred to you by my friend, Dr. Ruffin Benton, in Brevard, NC. As he explained to me, your company would come to me to get my instrument rating completed. I was excited when I reviewed your website and sent you a message on Sunday night, and then received a response within 15 min! The next day we had our first call together and you made the entire process seem almost too easy. Since I had not completed my written test, you put me in touch with King Schools and a very helpful person that sent me the King School’s Instrument Rating Knowledge Test Course immediately. I studied the King program exactly as recommended, took the three practice test and was ready to take the written. Day three of our 10 day training program, we flew to a test site and I passed the written test! What a relief. Just as your web site promised, in just 10 days of training I had my Instrument Certificate! Reflecting back on the 10 days, your selected instructor and I worked night and day. We completed 33 hours of ground training, 32 hours of flight training of which 3.4 was night, 5.0 actual IMC, 22 simulated (under the hood), 13 cross country, and 50 full approaches. In addition to all of this training, your instructor had to teach me how to use my Garmin 650 GTN, along with three Advanced Flight Systems glass panels. Since my plane is a high performance Vans RV-10 with a I-540, 260 HP, I needed much time learning and holding the correct settings, speed, mixture and prop controls. Your instructor had his hands full and even took the time to make me several check list that I could follow. I can’t thank you enough Tony for your attention to detail, follow through, and having advanced senior instructors that will teach in a high performance plane in IMC conditions. Since last week, I have already filed and completed three IFR flights for business and have saved over 10 hours in travel time. This will be the best investment that I have made. Thanks again Tony. 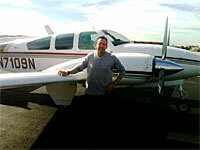 I very much enjoyed working with John on my instrument rating and getting to know him as a person. I found John to be an excellent pilot with deep knowledge of the complex and busy Los Angeles airspace. He is also a very effective teacher of the key concepts to transition a VFR pilot to an instrument pilot.. I would highly recommend John to help any pilot become instrument rated. Lou was great to work with, he was very patient and never seemed to get frustrated when I would repeat many questions. He was well organized and immediately conveyed the “plan” as soon as I arrived to begin training. Lou is extremely proficient as an IFR instructor and I highly recommend him to anyone seeking an IFR rating. Lou was very conscious of not “over-stressing” me during actual flying time; Safety and my ability to comprehend the lessons was a top priority. The Actual IFR experience I received during a cross-country trip was invaluable. Lou was good to allow me to make mistakes, a very effective training tool. I am very happy I selected AFIT for my instrument training. First, I believe that immersion training is a superior method of training. The student does not suffer from the decay of time between lessons. Second, as a very busy professional, it would have taken many months to achieve my instrument rating while trying to fit my schedule into that of a traditional instructor. I believe AFIT is a great value for the money. While it seems expensive, the actual cost of traditional training with the inherent inefficiencies will be very nearly the same. The difference being the amount of time that has passed for the student while not being able to fully utilize the benefits of general aviation and the aircraft. Most of all I want to commend my instructor John.John is incredibly knowledgeable and a talented instructor. The training was intense and he knew when to change it up to keep me fresh and how to change his delivery if I was struggling. If I were to complete the training again I would select AFIT and I would specifically request John for my instructor. Just a brief note to tell you how well my accelerated instrument training went last week. My instructor, John, was a consummate professional. His technical skills and practical knowledge of instrument flying made my week of training not only interesting, but extremely rewarding in terms of flight safety and procedural flying. His engaging personality and teaching methods made it very easy to grasp the skills necessary to become a capable and competent instrument rated pilot. I have already recommended John and AFIT to several local friends and fully intend to reengage John’s services for my commercial training, possibly in the fall. The skills I have garnered have given me great confidence to handle instrument conditions and the drills provided by John I believe will keep me and my family safe for many years. The best decision I made trying to get my IFR rating was having AFIT send out senior instructor John T to work with me. After years of attempting to finish it, I feel totally comfortable in the IFR system now. John is a very patient and understanding instructor I would highly recommend John and AFIT. As I mentioned in our phone conversation, I found your training to be excellent. Not knowing how I might respond to the intensive type of training, when I first took on the task, I am pleased with the outcome. I was especially appreciative of the instruction style of John and his knowledge of instrument flying. The approach he took with me was perfect for the way I learn. He introduced new tasks at measured steps that built on and reinforced the previous day’s lessons. I have had a chance now to fly in actual IMC on several days, and feel completely confident in what I am doing. I would recommend your company and John to anyone interested in your program. I wanted to take a moment to thank you for recommending Lou to me. He was a “great instructor” and made the process very easy. Lou was very focused on the skills needed to pass the check ride. Like most pilots, I was rusty from using the autopilot too much and he got me flying the PTS standards in a matter of days. I would strongly recommend Lou to anyone for training and you are welcome to give my information out to anyone who is considering AFIT. I found the accelerated program much more conducive to learning since the daily repetition of flying and studying reinforced the skills, unlike the conventional approach where you spend half of each lesson relearning what you forgot from the last week. Tony, thank you again. Talk to you again when it’s time for the commercial. We got it done, right on time, in 10 days. John was a great teacher. patient, extremely competent and a great friend. We really enjoyed ourselves. This program was a real value to me. Having the instructor constantly available was perfect. Again, for me, John was a great fit. His really great mastery of the rules and techniques of IFR flying….. and his even tempered style made the experience enjoyable and profitable! It will be a pleasure for me to recommend AFIT. We all know that getting an instrument rating is not an easy task. I am happy to say that AFIT has allowed me to accomplish this task because of the quality instruction that I received. I have had a few instructors over my short aviation career, but have never been so fortunate to have John in the right seat. John’s aviation knowledge is extensive, but it is his ability to adjust his teaching methods to best suit the individual that is amazing. We flew my SR-22 “Perspective” over 40 hours and were fortunate to have a few days of IMC. John’s great depth of Garmin avionics afforded me a deeper understanding of my planes potential which ultimately prepared me for my practical test. After 10 days I had my Instrument rating and a new friend. I highly recommend AFIT and John. Just a note to let you know how much I enjoyed working with Bill out in Georgetown, TX. He has a wealth of airplane knowledge but most of all he has the attitude, desire, and personality of a teacher. Not everyone can say that. We had some starts and stops due to our King Air Easter Sunday incident, the pilot’s funeral and some central Texas weather, all things that could not be controlled, but you and Bill worked with me on all of those things and we got it done. I really like your 10 day IFR program that ya’ll have set up. Once again, it was a joy working with Bill and A.F.I.T. and the pleasure was all mine! My intentions when I arranged my “finish up” IFR training with AFIT was to do just what it says, complete my training and obtain my instrument rating at the conclusion. I have a great local CFII but trying to coordinate our schedules resulted in a lot of interruptions in training and then having to review before continuing on. Also for me I needed my feet to the fire to finish some things such as the written exam so by setting my date with AFIT my feet were smoldering and I got with it. Working with you Tony was very pleasant and (unlike me) you returns all phone calls and emails promptly and you and your team were very helpful in making my arrangements. It was great having My instructor, Bill E., assigned to me early on so I could establish a dialog and work with him to prepare for my training. Based on our discussions Bill decided on the number of days I would need prior to my check ride and prepared a daily lesson syllabus which I received early on along with suggested study subjects prior to his arrival. Bill E. arrived on time and we worked everyday, all day as promised. It is a challenging schedule, but if you set the time aside and commit to the daily routine I found it was’ (for me) a great way to finish my training and prep for my orals and check ride. Bill was a consummate professional who was great to work with. Although we enjoyed casual discussions to break the work up he was always focused and committed to insure we did what was required to properly cover the material and flight time. When I met with my examiner I felt prepared and confident and my testing went great. I was instrument rated on schedule. I have Bill’s number if I need to discuss anything and that’s nice to know. I would certainly recommend Bill and AFIT to anyone looking to complete their instrument training. My training experience with John was incredible. I learned so much through this experience that goes beyond preparation for the oral and the flight test. His professionalism and tenacity to the goal of assuring competence of this student are stellar. Your introductory comments of his skills and master teaching skills was accurate and somewhat understated. I just wanted to drop you a note regarding my recent experience working with Bill. As you may recall Bill was going to come up to Illinois to work on my IFR rating at my home base. Unfortunately the week before we were to start training my plane was found to have 4 cracked cylinders. Perfect timing! I talked to Bill and he recommended I come to Texas and get my ticket in a new 172 with the G1000. The first day I flew the plane I thought there would be no way in hell I could master the G1000 let alone fly it in IFR. I was wrong! I only had 10 days…………period. Bill had me flying 5-6 hours a day doing approach after approach. If I screwed up……….we did it until I got it right! We flew in class Bravo airspace, landed at Houston-Hobby airport, flew in real IFR even the beginning of a thunderstorm with a landing in unforecast and abrupt wind shear conditions. We topped that off with night IFR flight in and out of the clouds with varying degrees of rain. What a great experience!!!! Bill’s 30 years of experience from flying everything from a 152 to a Falcon jet and everything in between offers a wealth of knowledge that he imparts on you every waking moment. Even lunch……Bill brings his “pink cards” . These cards have been developed over his many years of listening to examiners questions during the Oral part of the Check ride. Not one question was asked by the examiner that Bill did not quiz me on at some time during my 10 day visit. In all reality……..after what Bill had me doing day in and day out and the tolerances that he demanded………………the check ride was my easiest day in the plane. He has a real gift teaching IFR. Even if I became frustrated Bills calm, encouraging demeanor would easily get me back on track and perfecting the approach. Great experience, great teacher and I feel I have made a friend for life. I will most certainly be back for my multi and commercial ratings. Thanks again……..if you ever need a reference do not hesitate to call me. My training with Bill was exactly what I’d hoped for and exactly what you promised: We did hard concentrated work over 5 1/2 days and, it’s fair to say, that I learned more in those five day than I had in the preceding six months. Bill was focused, demanding, generous, and, above all, helpful. He helped get me to the point that I was ready to pass what turned out to be a very demanding check ride. But more important, he helped me to become a safer, surer, more knowledgeable pilot. I’m delighted that I had the chance to work with him. Would just like to thank you and John for helping me to get my Commercial and Instrument rating in only 15 days in Boulder, Colorado. Johns 10,000 plus hours really translates into his instruction and his ability to translate anything into real world lessons and instruction. John is also a A and P mechanic and is very knowledgeable about system and avionics I had a hard time finding something he didn’t know about. My aviation knowledge was increased significantly as well as my confidence in my own flying ability. Accelerated flight training is the only way to go for your instrument rating because it forces you to focus on instrument flying and instrument flying only, in the long run it saves you a lot of time and money. I will now take these new rating and knowledge back up to Alaska where I will be flying Dehavilland Beavers and 206’s on floats. Again thank you Tony and John it was a great experience. Wanted to take a minute and thank you and Ed, for helping me complete my instrument training. You and your organization are dedicated top notch professionals. The training was intense and your commitment to see me through was extraordinary. AFIT and John delivered, as promised. I never thought I could complete the IFR training with a successful check ride in such a short time! I just wanted to drop you a quick note to let you know how incredibly impressed I was with the training at your flight school. As a business owner who flies back and forth to service my clients, I felt that it was necessary to take one step further in my aviation training and get an instrument rating. Cholena, my flight instructor, exceeded my expectations. She was extremely professional, understood my limitations and strengths, and tailored the course to focus on my abilities. Because of my time constraints, she worked with me around my schedule, which was very beneficial and efficient. In just 8 days of intensive training, I was qualified to pass the checkout ride. And, while there was an incredible amount of pressure in a short amount of time, your course was the perfect fit for a busy businessman like me. I thoroughly enjoyed your school, the course, the training and the instructor, and I would highly recommend it to other professionals like myself. The commercial training at AFIT was “Excellent”, I would recommend AFIT to anyone who has a tight schedule and just needs to get a rating done in a short amount of time. My instructor Eric was Great and prepared me very well for my checkride. Thanks AFIT…. I have been looking forward to earning this rating for a long time. It was a pleasure working with Eric and learning from his level of knowledge and instruction. I truly feel I earned this rating and it was hard work, but worth the effort and the preparation. Preparation is key for this program. You have to have all of the academic knowledge, legitimate prerequisite hours, and book study fully complete prior to beginning this course. I wanted to focus this training on the actual stick and rudder skills of instrument flying and feel I received just that. I am from the school of accelerated instruction flying jets in the Navy and the parallel to Navy accelerated flight training was no stranger to me, but I was prepared for it mentally and physically and that made a difference. Eric’s flexibility and adaptability to fulfill the training in the 10 days and according to my level of learning and minimum prerequisite hours made me well prepared the check ride. Even after having to learn a high-performance 172XP in the process did not impede on the instrument training and was crucial to completing my syllabus. The check ride is NOT a guarantee pass in this program, but I certainly feel Eric prepared me to earn this rating even by day nine. Thanks for the opportunity to work with AFIT and Eric. I hope to refer those who are only serious about earning an Instrument rating to AFIT in the future. I am now back in San Antonio, Texas extremely grateful at the superb training and instruction I received via AFIT from my instructor John in Boulder, Colorado! Where do I start to sing the praises of AFIT’s program at the hands of John? I passed! But that’s not the bottom line. I learned a lot more about flying with him that went way beyond just passing that Checkride. I felt that throughout the entire process, John was always there for me-totally committed to not only making sure I passed the Checkride but that I would be a significantly better pilot in the process, regardless of the outcome. The process was Intense. The subject matter is intense but at every moment of everyday John was there doing his best for me on my behalf. For example, Colorado weather as the calendar flips from winter to spring is challenge in its own right, but John is extremely flexible and made sure we made the highest and best use of our time at every moment. Getting away from my home base and taking AFIT’s training in Colorado was the right choice for me. For a South Texan to fly to Wyoming [a State I had never been to] in temperatures below freezing (! ), flying ‘no gyro’ precision PAR approach to minimums is an experience that can simply cannot be ‘simulated’ in a metal box on the ground or memorized out of a book. Being able to have a superb instructor of the impressive caliber that John offered me all day, every day, day after day is, I believe, the most efficient way of learning this challenging discipline. My three regrets are 1.) that, going forward I don’t have access to John in San Antonio on a day to day basis- I will truly miss him; 2.) that I don’t own ‘my airplane’ which would have ultimately maximized the unique opportunity flying with John can be and 3.) that I did not take this course with y’all sooner. “All’s Well That Ends Well. ”I passed on the first try and I am, once again extremely grateful to everyone involved. Thank you. My experience with the AFIT team was outstanding I have had 7 instructors over the course of 3 years from getting my sport pilot to private pilot, to complex rating, to my instrument rating, but by far,, way way far! John was the most knowledgeable and well-mannered instructor I have ever had. He had nothing but encouraging instruction and instruction that would nail the small points that I might be missing with easy to understand language and guidance. If only all instructors could be as he is everyone could learn to fly with encouragement and ease. If anyone is having trouble getting through instrument flying I have the guys for you. I can’t say enough about AFIT. Thank You Ever So Much. Bill was “Fantastic”. 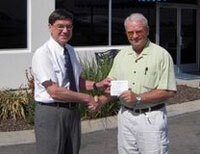 He is extremely knowledgeable and an “Excellent Instructor”. I was significantly over prepared for the check ride. It was also great spending time with him. Safe travels and hopefully our paths cross again soon. As you know I’m a returning customer, having gone through your PPL program last year. One of the reasons, if not the main reason, for being a returning customer is the outstanding quality of your instructors. This year I worked with Todd from Rexburg, Idaho who was clearly deeply committed to seeing me succeed. As you would expect he knew the practical IFR world backwards and forwards. But he also found the right balance between pushing me when I needed it and being encouraging when that was the right way to get me over a hump. Not to mention that we had a few good laughs along the way. I am very happy to recommend Todd and A.F.I.T. to anyone looking to do an accelerated program. I passed my checkride today! I’m officially the newest Commercial Pilot on the block. Huge thanks to my good friend and instructor during this intense 5 days, John. Also enormous thanks to AFIT for the accelerated program, and thanks to that beast of an airplane for enlarging my arm and shoulder muscles. Amazing experience and the Best Commercial training I can imagine. With John and AFIT at Sphere One Aviation. Todd was “Great”. I learned a lot from him, he is truly patient. I liked the fact that he let me fly the airplane with really no interference. 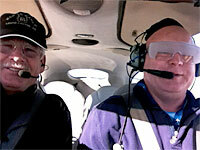 It’s been nearly a month since I completed my IFR training with John in St. George, Utah. I finally have had the time to reflect on my experience. First I would like to thank you for providing such an organized and professionally run business. Secondly I would like to thank my instructor John for putting up with me, there were times where he had to be a baby sitter, and other times where he was forced to slap my hand to stop me from screwing things up. If anyone out there wants to obtain there IFR ticket, I would highly recommend giving AFIT a call and be sure to ask for John to be your instructor. John went above and beyond. He’s a “Great instructor” able to convey the fundamentals of the commercial performance and emergency maneuvers exceptionally well. Thanks again. I wanted to thank Todd and AFIT for a great flying experience and for helping me to complete my training. Being able to get everything done in a concentrated five days during leave was exactly what I needed. Todd’s experience as an instructor and the sunny Idaho/Utah weather (with a couple of stiff cross-wind days) made for enjoyable training experience. The oral and practical were as expected given your strict adherence to PTS numbers. Well done! I’m enjoying the new certification. Next, IFR! This past Saturday I passed my Instrument check ride after a very intense 10 days with an extremely dedicated instructor. At 67 I was concerned that I had bitten off more than I could chew but Hal’s patience, attention to detail and unbelievable dedication to my success overcame the “you don’t learn as easily when you get older syndrome”. Anybody who has the opportunity to learn with Hal will not only have a great opportunity at success but you will gain a new friend. I want to thank you again and tell you how glad I am that I used A.F.I.T. for my instrument training. Taking the 10 days off of work was well worth the time and money. It was a pleasure working with Ed for the 10 days. He is very easy going and has a tremendous amount of knowledge. Ed was able to explain all the material in a way that made it easy to learn. I recommend A.F.I.T. and Ed to anyone who is serious about attaining their IFR certificate. I would like tell you how good the training with Ron was for me. I highly recommend AFIT and Ron to all my friends. Ron is a very’ good instructor and an even better person. Thanks for your help and for giving me the chance to get my Instrument Ticket. It was a wonderful experience. I just wanted to share my impressions of my recent training with Bill and AFIT. Once I arrived in Texas, we got right to work. I had been asked to have my written completed before I came for training and I easily would have finished with training in less than 10 days if I had completed my written first. Unfortunately, my home and work schedules didn’t permit me to finish it before my training began. Bill worked with me daily to review any questions I had on my practice written tests to make sure I had complete mastery of everything needed both for the test and for actual proficiency. We did lots of flying under the hood every day. We even worked during lunch breaks with his famous pink flash cards to practice for the oral portion of the exam. I took the written and scored a 95. 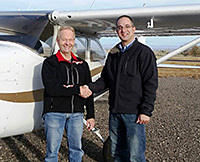 I also easily passed my checkride too thanks to Bill’s flying skill and knowledge and his ability to teach both to me. The most important thing I gained by working with Bill and AFIT was not just an instrument rating, but instrument proficiency. The morning after my checkride, I filed my flight plan and took off into instrument conditions for the first time and flew home safely and confidently in the clouds from Texas to New Jersey with a fuel and meal stop in Arkansas and another fuel stop in West Virginia. Two days later, I flew again in IFR conditions. Since I earned my instrument rating earlier this month, I have flown about 40 hours in actual IFR conditions. Each time I fly I am thankful for the skills I learned which make me both confident and safe. I don’t hesitate to fly because of visibility as long as I am within minimums plus a safety margin. I can read and predict the weather much better now too thanks to my training. The practical tips and experiences shared by Bill have also helped me to make better informed choices about when to fly in IMC and when to wait or drive. I still hear his voice when I unintentionally deviate from my intended course by a degree or two – “Robert, level the wings!” I’m still learning, but I have a great foundation to build upon thanks to my AFIT training! 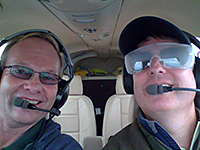 I am writing to thank you for arranging my flight training with John in Boulder, Colorado. 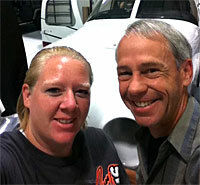 John helped me finish up my fixed wing add-on rating in just five (5) short days. In addition, John gave me an introduction to mountain flying as well as high performance and complex airplane experience while flying an awesome V-tail Bonanza. Your company is top notch and the level of customer service you provide is second to none. Prior to my training you were responsive to my numerous inquires and answered all of my questions. I researched several other accelerated programs before signing up with AFIT, however, none of them displayed the level of courtesy and professionalism I found with your company. These traits carried over to my flight training with John. I cannot say enough good things about John. He continued the excellent customer service by making himself available to answer my questions prior to my arrival. After meeting John and spending a few minutes with him, I knew I was in good hands. John’s level of knowledge about “all things” aviation is amazing and he possesses superior flight skills. Most important, however, John is an outstanding teacher and taught me fundamental safety skills that eluded me in my prior training. In the end, John taught me how to be a better, safer and more confident pilot. I plan to return to AFIT for my instrument rating as soon as I can. As a recently minted private pilot, my pursuit of an instrument rating in an accelerated setting was particularly challenging. In addition to needing the requisite hood time, I lacked much of the required 50 hours of PIC cross country time. Despite the unpredictable late summer weather, Eric was somehow able to fit almost 50 hours of flight time (more than 40 of which was under the hood) into 9 short days. 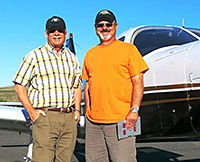 He creatively planned flights to hone my instrument skills, teach me to fly a new airplane, and satisfy all requirements for taking the instrument check ride on day 10. We worked the didactic portion of the training into the mornings, evenings, and between flight legs. We were even able to work in a 50-hour inspection on the airplane for a bit of hands-on learning. As a pilot, flight instructor, and A&P, Eric’s depth of knowledge far exceeded that which I had experienced during my private pilot training. I hope to get back in touch with AFIT, and with Eric, once I am ready to pursue a commercial rating. You have developed a complete product with this instrument course; I would recommend it to anyone who is serious about learning to fly instruments. Thank you. I wanted to let you know the training was great(as expected). I feel much more comfortable with the IFR system now. I got a ton of valuable information from Ed and very much enjoyed spending time with him. I don’t think we had less than a 12 hour day the 3 days we trained! He truly has a wealth of knowledge to share….his teaching background and 10,000 hours in the air certainly shows.